Some people don't like getting older, but my girl Blair (over at Wild & Precious) sure does and this lovely group of Blair's blogging buddies and I have teamed up to throw her a big birthday giveaway celebration in honor of her 30th birthday tomorrow! I have had the honor of not only knowing Blair and getting to call her my friend for a few years now, but I've even got to slumber party it with her at a blogging conference. She's a great friend, she doesn't kick in her sleep and she's just the real deal. I absolutely love being in her posse of bloggy friends and being a part of this fun day to celebrate her!!! What's the prize? 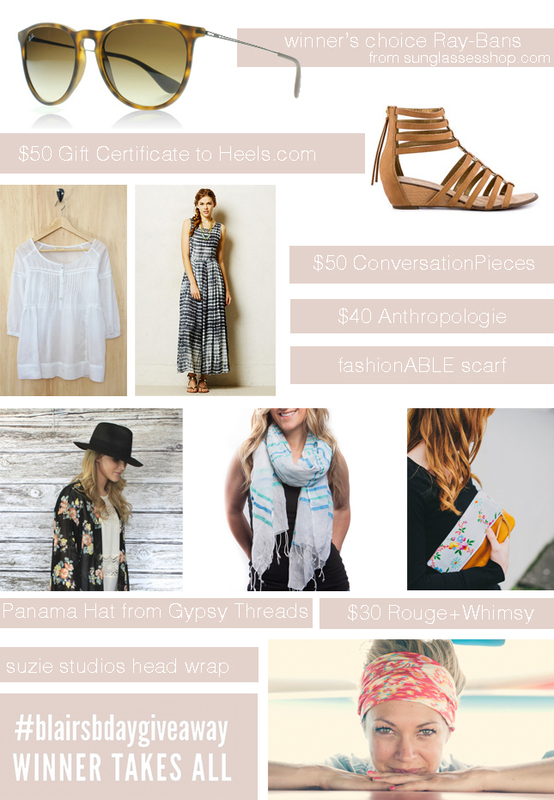 Blair has themed her upcoming 30th year as the "year of boho" -- so this giveaway is FULL of great accessories and gift cards to keep you boho styling. One winner takes all. The Prizes: Winner's Choice of Ray-Bans from sunglassesshop.com, $50 gift certificate to heels.com, $50 gift certificate to Conversation Pieces, $40 Anthropologie gift certificate, a fashionABLE scarf, brown panama hat from Gypsy Threads, $30 gift certificate to Rouge + Whimsy, and a boho head wrap from Suzie Studios! -- that's a loot over $375! !